Singapore. 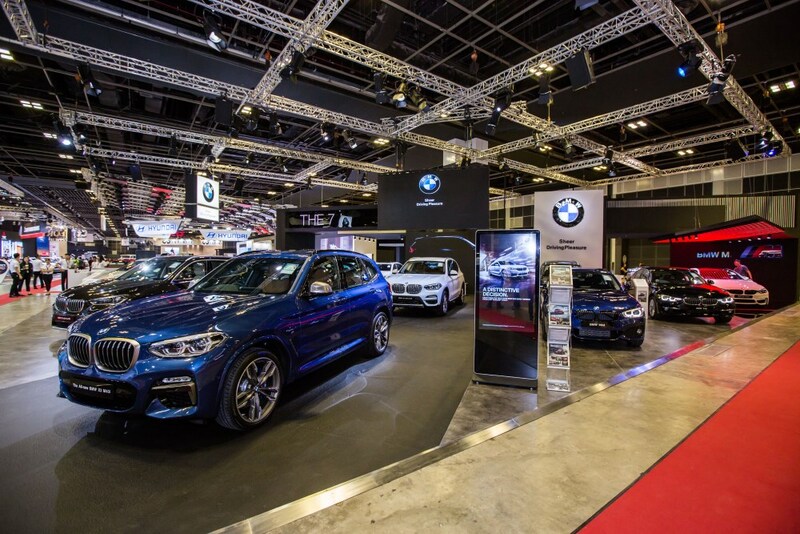 BMW Asia and Performance Motors today launched the all-new BMW X3, a car that is set to write the next chapter of its success story with an even more striking and dynamic design, powerful yet efficient drive systems and luxurious appointments, at this year’s Singapore Motorshow. BMW Asia and Performance Munich Autos also launched today the all-new BMW X3 M40i, the first ever M Performance model in the X3 line-up, setting new standards with its sharper dynamics, high level of exclusivity and standout emotional appeal. Developed with an insatiable appetite for revs and superb pulling power, the 3.0-litre M Performance six-cylinder in-line engine ensures the all-new BMW X3 M40i sits on the top end of the model range. “On the local front, over 2,000 units of the BMW X3 have been sold in Singapore since its launch in 2004. It has also been the second-best selling BMW X model accounting for almost 30% of total BMW X range sales since 2014. On the back of this success, we are confident that the all-new BMW X3’s performance and versatility will excite our customers in Singapore,” added Mr. Herdtle. The all-new BMW X3 elevates the already boldly dynamic design of its predecessor to a new, even more eye-catching form. The third generation of the pioneering premium mid-size Sports Activity Vehicle (SAV) treads a familiar BMW X family path combining rugged off-road looks with sporting presence. The exterior dimensions of the all-new X3 may be largely unchanged, but its five-centimetre-longer wheelbase, long bonnet and extremely short front overhang with finely balanced proportions emphasises the perfect 50:50 distribution of weight between the front and rear axle – give it the edge over its predecessor. On the front end, the expressive “three-dimensional” kidney grille treatment and fog lamps featuring a hexagonal design for the first time on a BMW X model underline the confident character of the all-new BMW X3. Moving to the rear, the light clusters (whose three-dimensional look in full-LED guise gives them considerable visual impact), markedly downward-sloping roof spoiler and twin exhaust tailpipes bring matters to a suitably muscular conclusion. Three trim variants adapt the visual character of the all-new BMW X3 to tie in even more closely with the customer’s personal taste. For example, the xLine model – with radiator grille and other exterior details in Aluminium satinated and specifically designed light-alloy wheels – emphasises the robustness of the Sports Activity Vehicle. The M Sport model focuses its attention on the dynamic gifts of the all-new BMW X3 with M aerodynamic features, a sports braking system highlighted by blue-painted callipers, a particularly dramatic wheel design and the optional exterior paint shade of Phytonic Blue. The all-new BMW X3 can now also be specified with BMW Individual features such as the exclusive Sunstone metallic exterior paint finish. The interior of the all-new BMW X3 follows BMW tradition with its driver-focused and ergonomically optimised cockpit layout and carries over many aspects of the car’s exterior design. For instance, hexagonal forms and precise, bevelled edges also play a central role in the interior. The interior as a whole displays exceptional material quality, fit and finish, and impresses functionality-wise. One example here is the well thought-out storage concept, which offers more stowage space than ever before and ensures easier access. Evidence of the attention to detail lavished by the designers on the interior of the all-new BMW X3 includes the BMW X logo, which recurs frequently in different forms. For example, there is an embossed X in the electroplated accents on the front and rear doors and another on the B-pillars. The optional electroplated accents package adds extra class to the interior in the form of electroplated elements for the window buttons, start/stop button and controls in the centre console. In addition to distinguishing the exterior appearance of the all-new BMW X3 in their own particular variants, the three model lines also take specific approaches on the look and specification of the interior. The xLine model focuses on pureness and elegance, and is standard-fitted with full Vernasca leather upholstery sports seats. The all-new BMW X3 xDrive30i xLine also comes with contrast stitching and interior trim strips in Fineline Cove while the all-new BMW X3 xDrive30i M Sport and the all-new BMW X3 M40i come with Aluminium Rhombicle. The M Sport model provides a visual showcase of the all-new BMW X3’s dynamic talents with an M Sport leather steering wheel, sports seats in M-specific look, anthracite-coloured BMW Individual headliner and new interior trim strips in Aluminium Rhombicle in the interior, and the M Aerodynamics package for the exterior. There are also optional BMW Individual features for the interior, centred around three exquisite variants of Merino leather. The all-new BMW X3 comes standard with a number of new, chiefly comfort-enhancing equipment features not offered for its predecessor. These include three-zone automatic climate control, which adds separate temperature controls for the rear compartment, driver and front passenger. The driver and front passenger can also settle into optional perforated leather climate seats which offer active seat ventilation to maximise comfort when the going gets tough. To further improve the comfort level of the rear compartment, the angle of the standard 40:20:40 split/folding rear seat backrests can be adjusted individually thanks to the optional cargo function. This feature also allows the backrests to be released remotely from the load compartment, which expands the standard load capacity of 550 litres to 1,600 litres. Customers can also give the interior a particularly airy and classier feel with the optional and generously sized panoramic glass roof. Elsewhere, the standard-fitted acoustic glazing of the windscreen contributes to the extremely low noise levels in the interior. The two front side windows are also available with acoustic glazing as an option, ensuring even less wind noise generated around the exterior mirror caps, further reducing noise levels in the interior, even at high speeds. The all-new BMW X3 can be locked and unlocked using the optional BMW Display Key, a feature from the BMW 7 Series and BMW 5 Series. The BMW Display Key offers a whole series of additional features, such as keeping the driver informed of fuel levels, service or maintenance work due, and if the windows and sunroof are closed. The standard combination of contour lighting above the trim strip in the instrument panel and ambient lighting, which directs a soft stream of light downwards from below the accent strip, bathes the interior in an extremely classy and relaxing ambience. In darkness, the central monitor appears to be floating above the instrument panel. Customers can choose from six colour tones (Orange, Lilac, Mint, Bronze, Blue and White). The dynamic handling qualities of the all-new BMW X3 are rooted in its ideal 50:50 weight distribution, its meticulously honed chassis and the xDrive intelligent all-wheel-drive system, which made its debut in 2003 when the first generation of the BMW X3 was launched. Not only has the system been offering superior grip on slippery surfaces, it has benefitted the vehicle’s driving dynamics too. It is interlinked with the Dynamic Stability Control (DSC), which means that the power split between all four wheels can be constantly varied to always produce the handling characteristics for which BMW is renowned, even when the driver is pressing on. The latest set-up has further enhanced the dynamic prowess of the all-new BMW X3. Furthermore, the standard Driving Experience Control switch lets the driver choose between various configurations – i.e. ECO PRO, COMFORT, SPORT and SPORT+ modes – is designed to make the vehicle more dynamic, comfortable and efficient to drive. As far as the chassis technology is concerned, the third generation of the BMW X3 continues to rely on its winning formula of a double-joint spring strut axle on the front and a five-link rear axle. At the same time, this refreshingly engaging SAV delivers an even sportier driving experience than its predecessor without compromising on ride comfort. The engineers have succeeded in bringing about a considerable reduction in unsprung mass by fitting aluminium swivel bearings and lighter tubular anti-roll bars as well as optimising wheel location on the front. Plus, handling dynamics, straight-line stability and steering feel have all benefited from the uprated axle kinematics and the Electric Power Steering system with Servotronic function. In an effort to improve handling dynamics, roll moment has been redistributed a long way to the rear and the rear bias of BMW’s xDrive all-wheel-drive system has been further increased. Intelligent AWD management allows adjustments to be made as the driving situation demands while still maintaining maximum traction. In its basic specification, the all-new BMW X3 now rides on 19-inch light-alloy wheels, while 21 inch wheels come standard on the all-new BMW X3 M40i. The powerful braking system features lightweight brakes offering optimised performance as well as an Electric Parking Brake. To maximise safety, Driving Stability Control (DSC) including ABS, Dynamic Traction Control (DTC), Automatic Differential Brake (ADB-X), Cornering Brake Control (CBC), Dynamic Brake Control (DBC), Start-Off Assistant and Hill Descent Control (HDC) are all present. The sports suspension that forms part of the M Sport package offers the keen driver firmer suspension and damping, and beefs up the anti-roll bars. Alternatively, there is also the option of Dynamic Damper Control with electronically controlled dampers, which adapts the damper responses to the road surface and driving situation. At the same time, the driver can use the Driving Experience Control switch to vary the basic suspension characteristics as they please between the more comfortable and sportier ends of the scale. The sports braking system included with the M Sport package is available as an individual option. The blue-painted aluminium four-piston fixed callipers at the front and amply proportioned brake discs have high levels of thermal resistance and deliver phenomenal stopping power despite their extremely low weight. Last but not least, the variable sport steering comes as standard on all models. The all-new BMW X3 boasts the same off-road skills as its predecessor. The high ground clearance of 204 millimetres helps to ensure unhindered progress, not only when travelling along rutted gravel or sand tracks, over churned-up ground or in deep snow, but also on city centre roads with high speed bumps. The approach angle (25.7°) and departure angle (22.6°) of the all-new BMW X3 together with its breakover angle of 19.4° provides plenty of margin for negotiating steep sections or crests. With a fording depth of 500 millimetres, the all-new BMW X3 can tackle water crossings with ease. The all-new BMW X3 line-up consists of the xDrive30i and the range-topping X3 M40i. All the power units stem from the latest generation of BMW engines and operate more efficiently than the models they replace. Further improvements have also been made to the efficacy of both the eight-speed Steptronic transmission and the BMW xDrive intelligent all-wheel-drive system. The cutting-edge BMW TwinPower Turbo technology at the heart of the petrol engines comprises of TwinScroll turbocharging, High Precision Injection, Double-VANOS variable camshaft control and Valvetronic fully variable valve timing. All of the all-new BMW X3 models launched are equipped with xDrive intelligent all-wheel drive as standard. The new generation models enjoy the benefits of a more efficient and lighter rear differential and a modified transfer case, which made its debut in the current BMW 7 Series, and which operate far more efficiently, representing yet another fuel-saving measure. The all-new BMW X3 boasts a class-leading drag coefficient of Cd = 0.29. Reducing aerodynamic drag not only helps to lower fuel consumption, it also has a beneficial effect on noise levels. Besides its aerodynamically optimised proportions, the all-new BMW X3 also features additional underbody cladding, that provides unprecedented underbody sealing. Further refinements, such as the restyled roof spoiler with aero edges at the sides and active air flap control, round off its aerodynamic superiority. The latter regulates the flow of cooling air for the engine, brakes and air conditioning with even greater flexibility, and offers both aerodynamic benefits and further potential for savings in terms of energy and heat management. The all-new BMW X3 M40i is the first ever M Performance model in the X3 line-up with a 3.0-litre M Performance six-cylinder in-line engine and a wealth of model-specific set-up and equipment features, which both underpin the added impact to the exceptional performance credentials of this SAV. Among these features are the strikingly dynamic M Performance-specific exterior design cues, which include the M Aerodynamics package with design elements finished in Cerium Grey. The flap-controlled M Sport exhaust system with Black Chrome tailpipe embellishers, M Sport brakes, M Sport suspension with M Performance-specific tuning, variable sport steering and 21-inch cast light-alloy wheels also come as standard features. The all-new BMW X3 M40i comes standard with adaptive M Sport suspension, which covers an even wider spread of ride comfort and sportiness set-up options. The all-new BMW X3 M40i leaves the factory equipped with an eight-speed Steptronic Sport transmission complete with Launch Control. This transmission is a perfect match for the engine’s dynamic characteristics and can be operated using shift paddles on the steering wheel. In addition, its xDrive all-wheel-drive system has a far more pronounced rear bias than on the other model versions. The Performance Control feature integrated into the Dynamic Stability Control (DSC) system and acting on the rear wheels has been reconfigured to produce the dynamism, agility and traction for which M models have made their name. In the interior, the “M40i” logo adorns the sports seats, the front door sill strips and instrument panel, which provide further visual emphasis of the car’s performance capabilities. The all-new BMW X3 also excels when it comes to controllability and driver assistance systems. In addition to the iDrive Controller fitted as standard, the Navigation system Professional opens up the touchscreen and gesture control – functions which have so far been exclusive to the current BMW 7 Series and new BMW 5 Series. The touch sensitive central display provides a quick summary of the most pertinent information, and offers users intuitive access to whatever they are looking for. Gesture control allows numerous infotainment system and telephone functions to be operated intuitively using finger and hand gestures. The vehicle can also be controlled using the Voice Assistant, which offers the most advanced level of natural voice control currently available. This enables drivers to formulate their request in natural, everyday language instead of having to use set spoken commands. When it comes to driver assistance and (semi-)automated driving, the Approach control warning and Person warning with city braking function, Lane Departure Warning, Lane Change Warning, Crossing-traffic warning rear and Speed Limit Info, all form part of the Driving Assistant Package that comes standard with the all-new BMW X3 xDrive30i M Sport and the all-new BMW X3 M40i. These functions enhance both comfort and safety, while setting the benchmark in its class. The Head-Up Display that is standard on the all-new BMW X3 xDrive30i M Sport and the all-new BMW X3 M40i, allows the most important driving-related information to be projected directly into the driver’s field of vision. The Head-Up Display in the all-new BMW X3 is unrivalled in its segment for graphics, resolution and display options. Another unique feature that the all-new BMW X3 boasts over its competitors is the Remote 3D View function, which can be used to beam a three-dimensional view of the car’s immediate vicinity directly to a smartphone. The standard built-in SIM card also allows drivers of the all-new BMW X3 to use Intelligent Emergency Call with automatic locating and accident severity detection. With the new BMW Teleservice Accident Assistance, the vehicle now also detects low-speed collisions below the threshold for airbag deployment. The driver receives a message in the iDrive display offering to contact the BMW Accident Assistance service directly. A push of a button is all it takes to obtain professional support from the BMW Accident Assistance team, who can also put the customer in touch with a BMW Service Partner, if necessary. The digital services from BMW Connected bring intelligent connectivity to the all-new BMW X3 and connect the car with the user’s digital world. All the services revolve around the driver and are presented in an intelligent, personalised form that suits the specific context. The all-new BMW X3 is now available for viewing at the Performance Motors showroom and Performance Munich Autos showroom. 1. The all-new BMW X3 prices. 2. The all-new BMW X3 specifications. Performance Munich Autos is the world’s first dedicated BMW M dealership in Singapore that holds the retail rights to a full range of BMW M and BMW M Performance Automobiles. Performance Munich Autos Showroom is located at 315 Alexandra Road Singapore 159944. Showroom opening hours are Monday to Saturday, 8am - 7pm, Sunday and Public Holidays, 10am – 6pm. For more information or enquiries, visit www.bmw-pma.com.sg or call (+65) 6333 3933.